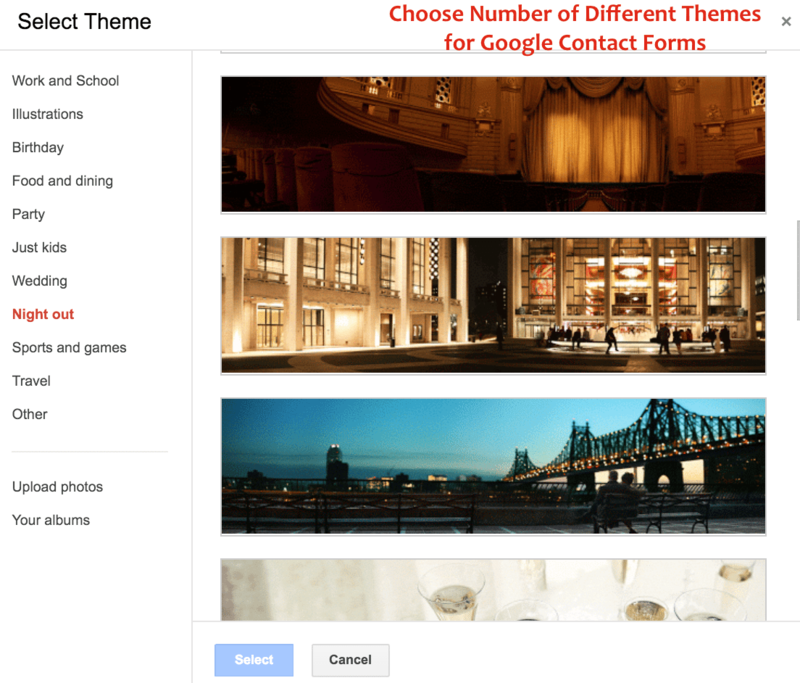 Last week on Crunchify we moved all contact forms to Google Forms. There is no more hassle to optimize/tune Wufoo or Contact Form 7 or other WP Forms. So far the response is amazing. 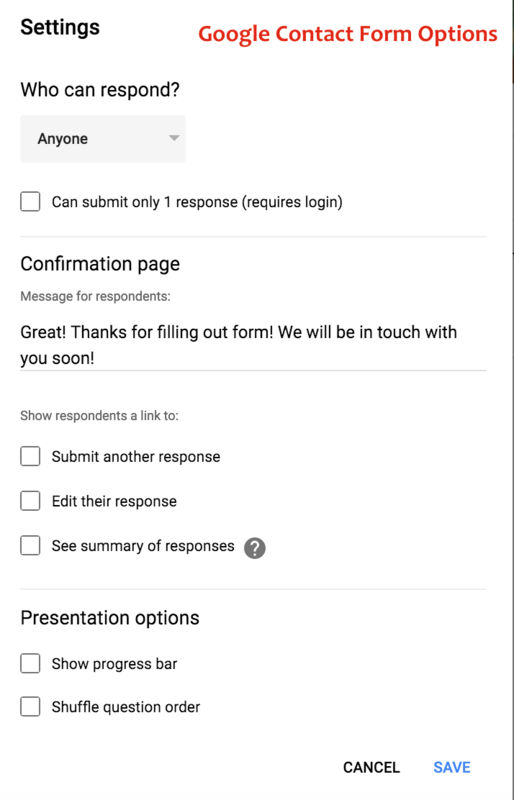 I loved the new look and custom styles on all Google forms. NOTE: Google form is completely free. I strongly believe that, there is no need to pay for monthly service fee for other WordPress forms. Why to pay for monthly/yearly service fee? There are quite a few and wonderful WordPress Contact forms available out there. Some of the best are Gravity forms, Ninja forms, WP Forms, etc. All of these forms come with free version with limited functionality. But the problems with them is, if you need more service/add-ons, then you have to pay for roughly $99/month or so. Price varies as per your selection. As you kind of got an idea why we choose Google Form, there are few more points I would like to share with you. Create your first Google Form. List all Questions like Name, Email, Message, etc as per your need. Click on Gear icon and provide your default Google From Options. By default Google Form doesn’t include all field data into email notification. 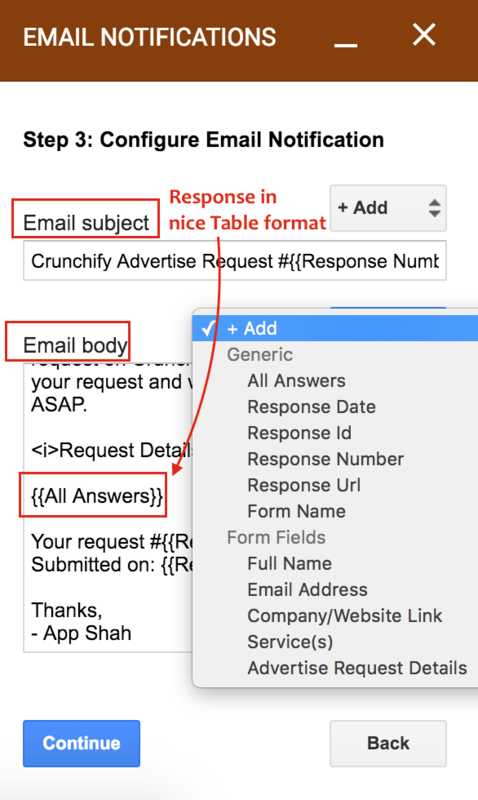 I’m using Email Notification for forms add-on which allows your send-out an email on form submission with bunch of other options as you see in below image. Click on Big SEND Button on top-right corner of the page. 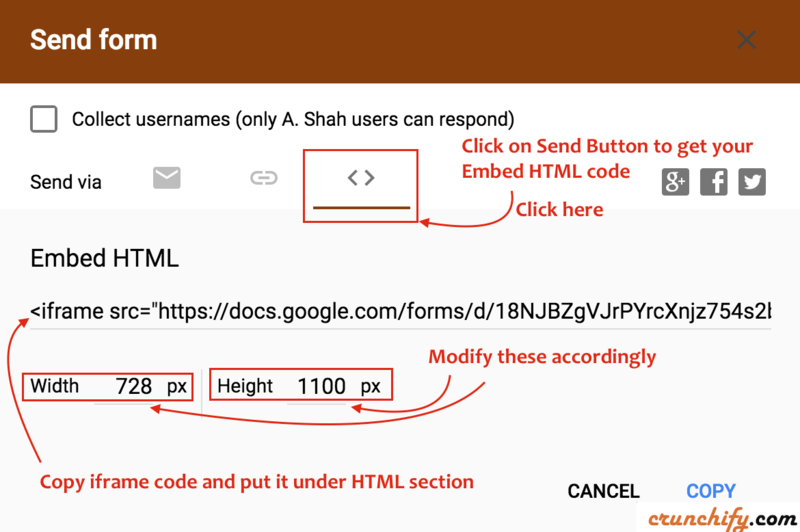 Click on Embed HTML icon and copy your iFrame code. Go to your WordPress Edit Post/Page screen and copy code into HTML section. And you should see nice Contact Form. Fill out the form and submit to see detailed email with all field included into your email. Here is a sample Email.. There is a catch though: It will simply send an email without all fields. So if you need all fields then just add free add-on as mentioned above. If you have any more suggestions on Google Forms setup then let me know. 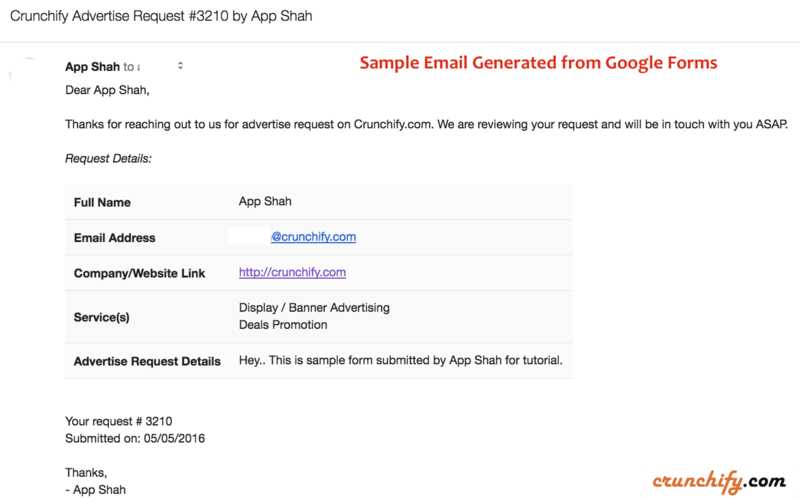 I would love to implement your feedback on Crunchify’s Google Form. I’m trying to implement this now, however, you left out something that doesn’t seem obvious to me. How do you put the form you created on your WordPress site? 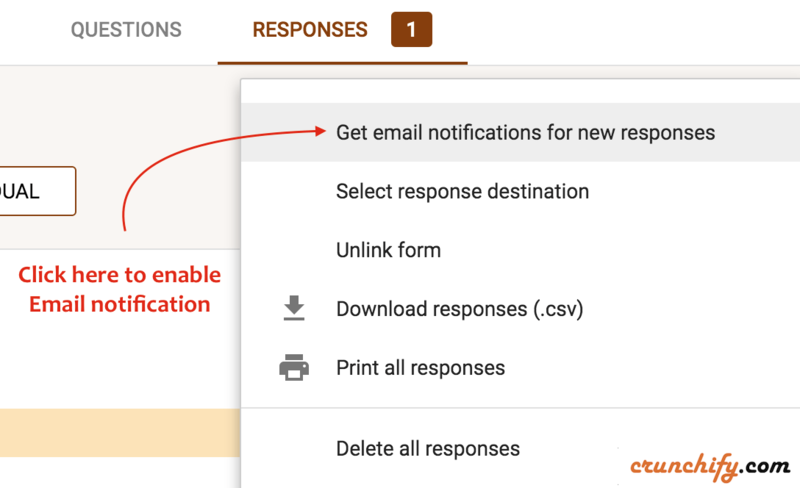 Also, when the notification email arrives to you (the admin), does it automatically populate the email address of the form submitter when you click reply, or do you have to copy and paste it (I hate that) And one other thing, where did you find the themes? All I see is an option for color. Thanks! Hi Mike. Thanks for stepping by and suggestion. I’ve just updated tutorial with your questions. * Question-3: Click on Color Palette -> Click on Bottom right corner image. let me know if you face any issue setting it up. Thanks, I didn’t realize you had to click “send” to get embed code haha. Last question for you, or maybe it could be the subject of another blog post. Can you style a form to match your site? For example, my site is a dark theme (light text on dark background) so it doesn’t look good on my site. Have you found spam to be a problem? I looked up captchas and there isn’t anything except taking a regular jpg of a captcha image and telling the user to type the characters you see in the image. I’m surprised google doesn’t integrate re-captcha since they own it. For your question on changing color – i haven’t played with it. Will update your once have more information. Wow no spam?? That’s pretty awesome.. In the case that you do get spam, you can generate a static captcha image here https: //captcha. com/demos/features/captcha-demo. aspx I just did a string a numbers and said on my form “type the numbers you see in the image” and then use the regex validation so the form won’t submit unless they type the numbers correctly. But if no spam, maybe I don’t need it at all. So yes, the only thing from stopping me from using this right now, is the styling. It looks pretty terrible on a dark theme site lol. Not just the color but controlling the CSS of the form itself. It’s rather stretched out vertically. It could be a lot more compact..
Yeah agree. Google Form comes with default CSS and font. Would be nice to have functionality for admins. I changed my site to a light theme so it’s not as bad now, but still I think it’s a lot taller than it needs to be, too much height to the form. Oh well, it’s functional, and without a plugin. How to do it easy? Hi Oliver – sorry as I don’t use Contact Form 7 – i don’t have solution for you.